As one of the most successful clubs in English football, Arsenal F.C. has a legion of fans and collectors. 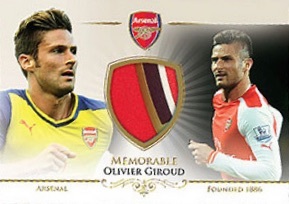 The Gunners are the focal point of the premium 2015 Futera Arsenal release that includes one memorabilia card, autograph or 1-of-1 card per pack. 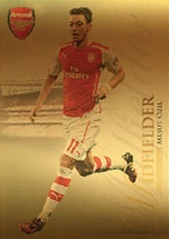 With 50 cards, the 2015 Futera Arsenal base set presents good coverage of the current squad and a look back at some of the best former players. Adding to that, limited-edition Gold (#/16) and Platinum (#/8) parallels combine to average 1:1.5 packs. Focusing heavily on game-used memorabilia cards, 2015 Futera Arsenal includes relics for some of the top current players. Memorable Memorabilia contains a piece from a game-worn item. The 12-card set is limited to 50 copies. Teammates Memorabilia doubles the fun with two current players and a game-used piece from each. The insert covers five different player combos and each is numbered to 35. The 15-card Virtuoso Memorabilia set is numbered to 27 and includes either one, two or three pieces of game-used or training-used memorabilia. The Mythicals takes the high-end product to another level with a refined design, gold-plated frame and actual diamonds. 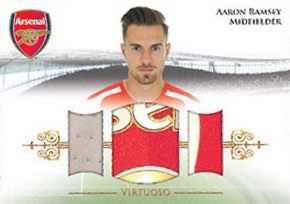 Featuring three Arsenal legends, The Mythicals is limited to seven copies. 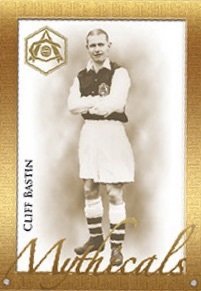 Among the rarest options in 2015 Futera Arsenal, 1 of 1 Printing Plates Production Sets include a printing plate card along with other elements from the production process. 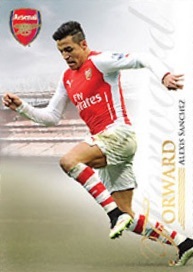 Lastly, while scarce, multiple autographs options are also available in 2015 Futera Arsenal. This includes gold-plated framed autographs with diamonds (1/1) and combo versions (1/1). All autographs are signed on-card. 2015 Futera Arsenal is further enhanced by a very limited production run. Only 15 cases (45 mini-cases) are available worldwide. Sealed packs and boxes are available direct from Futera. Like other Futera cards, each relic or autograph includes a unique code that provides detailed information about the card in question. Similarly, a 2015 set dedicated to Manchester City is also available. 12 cards. Serial numbered #/50.